Specifying the user interface (UI) to show when an application first starts. A location relative to an assembly. The application's site of origin. To provide a consistent mechanism for identifying and loading these types of files from these locations, WPF leverages the extensibility of the pack URI scheme. This topic provides an overview of the scheme, covers how to construct pack URIs for a variety of scenarios, discusses absolute and relative URIs and URI resolution, before showing how to use pack URIs from both markup and code. The pack URI scheme is used by the Open Packaging Conventions (OPC) specification, which describes a model for organizing and identifying content. The key elements of this model are packages and parts, where a package is a logical container for one or more logical parts. The following figure illustrates this concept. To identify parts, the OPC specification leverages the extensibility of RFC 2396 (Uniform Resource Identifiers (URI): Generic Syntax) to define the pack URI scheme. The scheme that is specified by a URI is defined by its prefix; http, ftp, and file are well-known examples. 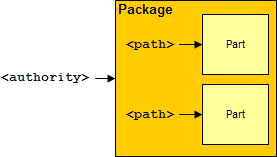 The pack URI scheme uses "pack" as its scheme, and contains two components: authority and path. The following is the format for a pack URI. 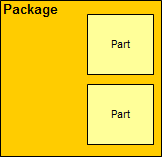 The authority specifies the type of package that a part is contained by, while the path specifies the location of a part within a package. Resource files that are compiled into the local assembly. Resource files that are compiled into a referenced assembly. 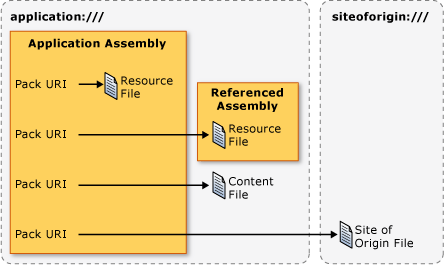 Resource files that are compiled into a referencing assembly. To access these types of files, WPF supports two authorities: application:/// and siteoforigin:///. The application:/// authority identifies application data files that are known at compile time, including resource and content files. The siteoforigin:/// authority identifies site of origin files. The scope of each authority is shown in the following figure. The authority component of a pack URI is an embedded URI that points to a package and must conform to RFC 2396. Additionally, the "/" character must be replaced with the "," character, and reserved characters such as "%" and "?" must be escaped. See the OPC for details. The following sections explain how to construct pack URIs using these two authorities in conjunction with the appropriate paths for identifying resource, content, and site of origin files. Resource files are configured as MSBuild Resource items and are compiled into assemblies. WPF supports the construction of pack URIs that can be used to identify resource files that are either compiled into the local assembly or compiled into an assembly that is referenced from the local assembly. Path: The name of the resource file, including its path, relative to the local assembly project folder root. The following example shows the pack URI for a XAML resource file that is located in the root of the local assembly's project folder. The following example shows the pack URI for a XAML resource file that is located in a subfolder of the local assembly's project folder. AssemblyShortName: the short name for the referenced assembly. ;Version [optional]: the version of the referenced assembly that contains the resource file. This is used when two or more referenced assemblies with the same short name are loaded. ;PublicKey [optional]: the public key that was used to sign the referenced assembly. This is used when two or more referenced assemblies with the same short name are loaded. ;component: specifies that the assembly being referred to is referenced from the local assembly. /Path: the name of the resource file, including its path, relative to the root of the referenced assembly's project folder. The following example shows the pack URI for a XAML resource file that is located in the root of the referenced assembly's project folder. The following example shows the pack URI for a XAML resource file that is located in a subfolder of the referenced assembly's project folder. The following example shows the pack URI for a XAML resource file that is located in the root folder of a referenced, version-specific assembly's project folder. Note that the pack URI syntax for referenced assembly resource files can be used only with the application:/// authority. For example, the following is not supported in WPF. Path: The name of the content file, including its path relative to the file system location of the application's main executable assembly. The following example shows the pack URI for a XAML content file, located in the same folder as the executable assembly. The following example shows the pack URI for a XAML content file, located in a subfolder that is relative to the application's executable assembly. HTML content files cannot be navigated to. The URI scheme only supports navigation to HTML files that are located at the site of origin. Path: The name of the site of origin file, including its path relative to the location from which the executable assembly was launched. The following example shows the pack URI for a XAML site of origin file, stored in the location from which the executable assembly is launched. The following example shows the pack URI for a XAML site of origin file, stored in subfolder that is relative to the location from which the application's executable assembly is launched. XAML files that are configured as MSBuild Page items are compiled into assemblies in the same way as resource files. Consequently, MSBuild Page items can be identified using pack URIs for resource files. A fully qualified pack URI includes the scheme, the authority, and the path, and it is considered an absolute pack URI. As a simplification for developers, XAML elements typically allow you to set appropriate attributes with a relative pack URI, which includes only the path. For example, consider the following absolute pack URI for a resource file in the local assembly. The relative pack URI that refers to this resource file would be the following. Because site of origin files are not associated with assemblies, they can only be referred to with absolute pack URIs. By default, a relative pack URI is considered relative to the location of the markup or code that contains the reference. If a leading backslash is used, however, the relative pack URI reference is then considered relative to the root of the application. For example, consider the following project structure. If Page1.xaml contains a URI that references Root\SubFolder\Page2.xaml, the reference can use the following relative pack URI. If Page1.xaml contains a URI that references Root\Page2.xaml, the reference can use the following relative pack URI. The format of pack URIs makes it is possible for pack URIs for different types of files to look the same. For example, consider the following absolute pack URI. This absolute pack URI could refer to either a resource file in the local assembly or a content file. The same is true for the following relative URI. Probe the assembly metadata for an AssemblyAssociatedContentFileAttribute attribute that matches the pack URI. If the AssemblyAssociatedContentFileAttribute attribute is found, the path of the pack URI refers to a content file. If the AssemblyAssociatedContentFileAttribute attribute is not found, probe the set resource files that are compiled into the local assembly. If a resource file that matches the path of the pack URI is found, the path of the pack URI refers to a resource file. If the resource is not found, the internally created Uri is invalid. Content files in referenced assemblies: these file types are not supported by WPF. Embedded files in referenced assemblies: URIs that identify them are unique because they include both the name of the referenced assembly and the ;component suffix. Site of origin files: URIs that identify them are unique because they are the only files that can be identified by pack URIs that contain the siteoforigin:/// authority. One simplification that pack URI resolution allows is for code to be somewhat independent of the locations of resource and content files. For example, if you have a resource file in the local assembly that is reconfigured to be a content file, the pack URI for the resource remains the same, as does the code that uses the pack URI. These properties can be set from both markup and code. This section demonstrates the basic constructions for both and then shows examples of common scenarios. Table 1 illustrates the various absolute pack URIs that you can specify in markup. Table 2 illustrates the various relative pack URIs that you can specify in markup. You specify a pack URI in code by instantiating the Uri class and passing the pack URI as a parameter to the constructor. This is demonstrated in the following example. By default, the Uri class considers pack URIs to be absolute. Consequently, an exception is raised when an instance of the Uri class is created with a relative pack URI. Fortunately, the Uri(String, UriKind) overload of the Uri class constructor accepts a parameter of type UriKind to allow you to specify whether a pack URI is either absolute or relative. You should specify only Absolute or Relative when you are certain that the provided pack URI is one or the other. If you don't know the type of pack URI that is used, such as when a user enters a pack URI at run time, use RelativeOrAbsolute instead. Table 3 illustrates the various relative pack URIs that you can specify in code by using System.Uri. Table 4 illustrates the various relative pack URIs that you can specify in code using System.Uri. The preceding sections have discussed how to construct pack URIs to identify resource, content, and site of origin files. In WPF, these constructions are used in a variety of ways, and the following sections cover several common usages. StartupUri specifies the first UI to show when a WPF application is launched. For standalone applications, the UI can be a window, as shown in the following example. Standalone applications and XAML browser applications (XBAPs) can also specify a page as the initial UI, as shown in the following example. If the application is a standalone application and a page is specified with StartupUri, WPF opens a NavigationWindow to host the page. For XBAPs, the page is shown in the host browser. The following example shows how to navigate to a page. For more information on the various ways to navigate in WPF, see Navigation Overview. The following example shows how to use a URI to specify a window's icon. For more information, see Icon. WPF allows applications to use a wide variety of media types, all of which can be identified and loaded with pack URIs, as shown in the following examples. For more information on working with media content, see Graphics and Multimedia. Resource dictionaries (ResourceDictionary) can be used to support application themes. One way to create and manage themes is to create multiple themes as resource dictionaries that are located at an application's site of origin. This allows themes to be added and updated without recompiling and redeploying an application. These resource dictionaries can be identified and loaded using pack URIs, which is shown in the following example. For an overview of themes in WPF, see Styling and Templating.